From a storytelling standpoint, the back-and-forth choreography is not without stumbles. Performance-wise, though, FX’s eight-part Fosse/Verdon (Tuesday at 10 p.m. ET) is never less than all that jazz. 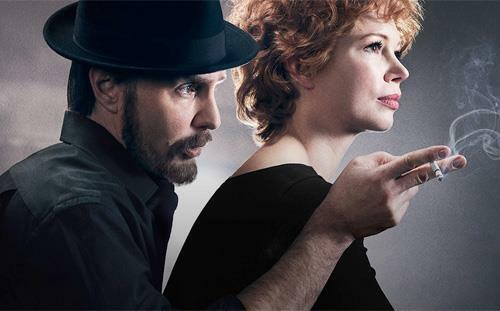 Sam Rockwell (top) as dance maestro/taskmaster Bob Fosse and Michelle Williams (top) in the role of dancer/mate/muse Gwen Verdon are exceptional embodiments of this peerless but problem-plagued partnership. Rockwell, coming off an Oscar nomination as George W. Bush in Vice, makes that role seem like a mere trifle. His comb-over alone is something of a wonderment. Williams, the least-noted member of Dawson’s Creek’s fab four, has gone on to accomplish more than her three co-stars combined with four Oscar nominations and what should be a certain Emmy win for this prolonged showcase of her talents. Among Broadway’s giants, Fosse has few if any peers. He won eight Tonys for his choreography and was nominated an additional three times. Verdon received best actress honors in three of the musicals they did together (Damn Yankees, New Girl in Town, Redhead) and was nominated in two others (Sweet Charity, Chicago). But she was never seen on camera in Fosse’s small but noteworthy collection of feature films. He won an Oscar for directing Cabaret and was nominated for his two other movies, Lenny and All That Jazz, in which Roy Scheider and Leland Palmer played approximations of Fosse and Verdon under the names Joe Gideon and Audrey Paris. In increasingly visual times, and as time passes, this makes it lamentably easier for younger generations to be completely ignorant of their towering accomplishments on Broadway, which in reality have been seen by only a select few. The self-destructive Fosse died in 1987 of a heart attack while Verdon expired in 2000 after a number of inconsequential film and TV roles in later life, including two appearances in Walker, Texas Ranger as a character named Maisie Whitman. Broadway legend Angela Lansbury became better known later in life for her many years as the star of CBS’ Murder, She Wrote. In contrast, Verdon never had anything close to a defining TV vehicle. Fosse/Verdon, of which the first five episodes were made available for review, revisits their gloriously turbulent times in a way that seems too piecemeal at first. Its flashbacks are frequent and at times all too brief, with white-on-black subheads -- “19 Years Left, 16 Years Left,” etc. -- spelling out Fosse’s remaining life span. Stick figure approximations of Shirley MacLaine and Liza Minnelli are fleetingly seen in the early going. MacLaine starred in Fosse’s film flop version of Sweet Charity while Minnelli won an Oscar for his acclaimed Cabaret. But neither registers in Fosse/Verdon. Fosse’s first wife, Joan McCracken (Susan Misner), is more of an in-and-out presence during the womanizing Fosse’s courtship of Verdon. She suffers from some sort of illness, with one of the between-flashback subheads reading “2,369 days before Joan McCracken’s death.” OK, but otherwise what’s the point here? Fosse/Verdon also can have a Mad Men vibe, with pals Paddy Chayefsky (Norbert Leo Butz) and Neil Simon (Nate Corddry) coming to the fore in an Episode 5 that pretty much stays in place at Fosse’s Southhampton, NY beach house. The rainy weekend gathering also includes impressionable young daughter Nicole Fosse (Blake Baumgartner), Verdon with her new boyfriend, and Fosse’s latest conquest, Ann Reinking (Margaret Qualley). Williams is particularly superb in this episode, whether singing a touching torch song in memory of her late close friend, Joan Simon (Aya Cash), or vowing to do Chicago with or without her husband, from whom she separated but never divorced. Verdon is something of a cunning enabler/disabler, knowing that both of their careers depend on collaboration. Her concern for his well-being is genuine, but also self-serving. If he doesn’t work, neither does she – at least not in a gainful way. And without her eye in the editing room, Cabaret might well have been a disaster instead of a triumph. The FX title is perfect in that sense. They really are one entity, although his constant cheating can be a considerable irritant. Rockwell is fully invested in a role that challenges him well beyond the semi-caricature he played in Vice. Self-assured and brusque when calling the shots, he’s otherwise an emotional adolescent, or sometimes an infant. As with Feud: Bette and Joan, FX is pulling back the curtain on a powerful but inherently flawed show business partnership. Except that Gwen Verdon and Bob Fosse endured, prospered, battled and used one another for a far longer period. Fosse/Verdon can be flawed in some of the ways it pieces together their lives and times. But any faults are not with the stars. Both FX and FXX channels on our cable system have irregular captioning. Sometimes they show up,more often,they don't. Ongoing fingerpointing between the channels and our cable company. Last night-Fosse/Verdon was not captioned during the original feed and the immediate repeat. So, worthless to this household. Somehow the nefarious religious,sports and shopping channels don't have these problems. Yet,we pay for it all. A shame,as Gwen Verdon's presence outside of the Broadway stage,was minimal. 1957's film version of Damn Yankees is pretty much it. The rest-dramatic guest shots. No Star of the Month on TCM,as there are no other starring roles and even there the Wonder Bread that was Tab Hunter gets first billing and lots of screen time,with Gwen's dancing toned down,though she got the poster. Nobody was going to pay to see the film with Tab in a wool baseball uniform. Odd,too,that Verdon,a huge star of musicals, made only one vocal LP under her name.